Click here to go to the “Icons” page of the Scottish Tourism Board’s website. 1. Like England, Scotland also has a national flower. What is it? What is the legend behind the flower? 2. Explain in your own words what “tartan” is. 3. When is Robert Burns’ birthday? 4. How do you say “police station” in Gaelic? 5. In the space provided on the answer sheet, draw a picture of the Scottish flag and add its name. 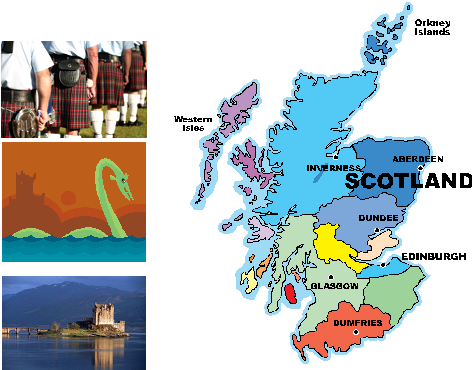 Click on this link to go to a website about the cities in Scotland. In the table on the answer sheet, fill in the name of the city that matches the following sentences. 1. You can watch dolphins swimming from the harbour of this city. 2. The longest street in this city is called Union Street. 3. Architecture is this city’s biggest attraction. 4. The Wars of Independence were fought in this city. 5. Complete this sentence: “…………… is what Paris ought to be”. 6. This is the fourth largest city in Scotland. Choose the event that most appeals to you and prepare a short one-minute presentation about it. You can use a search engine such as Google to help you. There is room on the answer sheet for you to make your notes.Your presentation should include at least: a description of what it is, when it is, why it appeals to you, and if you would ever consider going to see it. At the end of the lesson, your teacher will select a few students to give the presentations, so be prepared! !